"A Little Bit of Lovin' and a Christmas Tree." 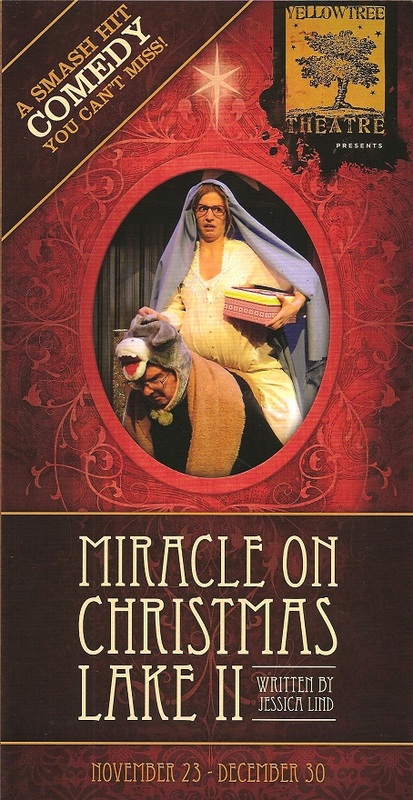 That's the theme song of this year's rendition of Yellow Tree Theatre's annual holiday show, Miracle on Christmas Lake II* (presented for the second year in a row after a successful three-year run of the original Miracle on Christmas Lake). The song is a pretty good description of the plot as well - the "Loving" being represented by nerdy soulmates Martha and Neil and small town theater owners Colin and Tess, and the "Christmas Tree" taking the form of a silly costume that Colin wears in the pageant thrown together at the last minute. But more than that, it's about a small community pulling together to save their beloved small town way of life. Not your average sugar-coated Christmas treat, Miracle on Christmas Lake II is silly and preposterous and hilarious and heart-warming. In the ridiculous (in a good way) plot, the entire town of Christmas Lake comes down with the goat flu (which causes its victims to make strange bleating noises and eat garbage), and is also in danger of annexation by neighboring town Potterton. Colin and Tess must put on a successful Christmas show to impress the Hollywood producer wanting to film a movie in Christmas Lake, which will save the town. It's the pretty much the same show as last year (written by Jessica Lind Peterson and directed by Jason Peterson, founders of the theater), with a few little tweaks and mostly new cast. The one constant in the five years of Christmas Lake is Yellow Tree regular Ryan Nelson as the Little House on the Prairie-obsessed piano tuner Neil, who thinks acting means doing an impression. He grows funnier and nerdier every year, and never fails to crack me up. Debra Berger ably takes on the role of Neil's girlfriend, the Sound of Music-loving Martha with a pet lizard and a mean tater tot hotdish recipe. Neil and Martha's big romantic moment is crowned with a rendition of (what else) "Something Good" from Sound of Music (the movie, but not the original stage musical, which had a song called "An Ordinary Couple" in its place, which has just outed me as a fellow nerd - maybe that's why I love Neil and Martha so much). Josef Buchel (the charming gentleman caller) and Rachel Petrie (of Four Humors Theater) play the only normal people in town, Christmas Lake native Colin and his wife Tess, who run the local community theater and try to corral these crazies into some semblance of a theatrical production. The charismatic Andy Frye returns as the Hollywood location scout with a secret, only this time he's given a new name (Stefan Stefanjovak) and a vaguely Eastern European accent. Rounding out the cast is Charles Fraser playing several characters, each one more quirky and outrageous than the last. The entire cast plays well together. One of the best examples of this is a fabulous slow-mo fight between Neil and Stefan over Martha. Hilarious and deftly executed. Over the last three years I've grown to love the residents of the fictional town of Christmas Lake, which will seem familiar to any Minnesotan (you can read more about last year's version of the show here, and about the original play here). I hope to return for many years to come. Jason says in this article in the StarTrib that there are plans for a third play. Until then, check out this trailer featuring scenes from the show accompanied by one of my favorite local musicians (thanks to Yellow Tree) Blake Thomas** singing "A Little Bit of Lovin' and a Christmas Tree" (I'm still waiting for it to be released as a single). In the show, the cast sings the song and it sounds quite lovely - several of these actors are hiding great voices behind their comedy. 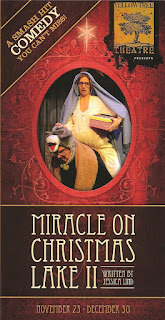 Miracle on Christmas Lake II from Yellow Tree Theatre on Vimeo. *I received two complementary tickets to Miracle on Christmas Lake II, and brought along nine more friends who happily purchased tickets, even though many of them had seen the show last year. It's a really fun group outing, especially when paired with dinner at Nectar Wine Bar in adorable downtown Osseo. **Blake Thomas is writing a new original musical Stay Tuned to be presented at Yellow Tree Theatre next spring, with help from his lovely and talented wife Mary Fox and Stefan Stefanjovak himself, Andy Frye (who is also directing Yellow Tree's next show, Circle Mirror Transformation, which I called "a quiet, real, completely satisfying exploration of five intersecting lives" when I saw it at the Guthrie in 2010). More information on both shows here.